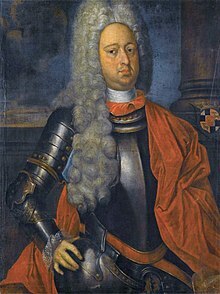 Friedrich Wilhelm of Hohenzollern-Hechingen (20 September 1663 in Hechingen – 14 November 1735 in Hechingen) was the fourth Prince of Hohenzollern-Hechingen and was also an imperial Field Marshal. Friedrich Wilhelm was the eldest son of Prince Philipp of Hohenzollern-Hechingen (1616–1671) from his marriage to Marie Sidonie (1635–1686), the daughter of Margrave Herman Fortunatus of Baden-Rodemachern. He was still a minor when he succeeded his father as Prince, so his mother took up the regency. Friedrich Wilhelm was sent to Baden, where he was further educated. He later completed his military training in Vienna. By the end of 1681, he took up the government of Hohenzollern-Hechingen himself. In the imperial army, Friedrich Wilhelm was Field Marshal and the owner of a regiment of cuirassiers bearing his name. In 1682, he participated in the suppression of an uprising in Hungary and in the victory in the Battle of Slankamen. In 1702, he was taken prisoner in Friedlingen. However, he managed to free himself. Two years later, he fought on the victorious side in the battle of Blenheim. Also in 1704, he fought under Field Marshal Sigbert Heister to suppress another Hungarian uprising. With permission from the Emperor, Friedrich Wilhelm reached an agreement with the Elector of Brandenburg about the Burgraviate of Nuremberg and became one of the first recipients of the Prussian Order of the Black Eagle. This page was last edited on 8 July 2018, at 11:20 (UTC).